Perhaps the most significant thing I have learned in my weeks here is that I don’t know much. And, as that sinks in I feel an urgency to get to work, because there is so much lost ground to cover! Even if Time stopped right now, it’s too late to catch up on the designations within mechanics, medicine, entertainment, science, culture, and everything else. Yet, I am optimistic of gaining a bit of yardage as I spend my days surrounded by thin slices of information, accumulated at such quantities that facts could be (by someone math-minded) measured in cubic feet. “What kinds of things are collectors searching?” That was my early question, and I see now how gracious everyone was with their oft-repeated, non-committal replies. 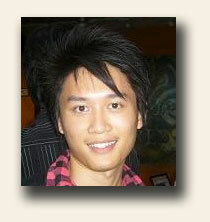 People are looking for issues concerning as varied a range of topics or content as there are human beings. Early motorcycle polo matches had me perched fifteen feet skyward, balancing five volumes — each of which is half my height and wider than I can put my arms around. The issue I was seeking had some key content of wide appeal: Capone and his gang. Mobsters are popular. So are serial killers and crime sprees. I skipped right over the portions of The Devil in the White City that dealt with the monster Henry Howard Holmes, and was instead caught up in the achievements of the human mind as exhibited in the Chicago World Fair. 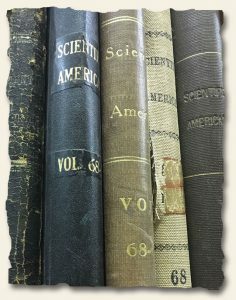 Here in our annals we have issues of Scientific American that feature Thomas Edison’s inventions, as well as multiple innovations of the 19th century — some of which were presented at that 1893 event! My mental censorship was so complete that I forgot the gruesome killings described in Erik Larson’s book altogether. But many people, for a myriad of reasons, are fascinated by details of historical mayhem. Bonnie and Clyde, John Dillinger and Jesse James‘ headlines still hold mass appeal. But in this case, the Detroit Free Press of 1928 contained something more valuable to some than the headline “Capone Pal Slain”. The back page photograph of a group from Yonkers was the treasure I unearthed for a research request. Scheduled to ship today, that paper will replace a photocopy in a transportation museum — which seems a very appropriate destination for a Michigan publication. Motorcycles, motion pictures, mobsters, and murder…those are a few things that interest collectors, and after this week things of which I now know a very little bit more. At this point I took a breath – carefully closed the newspaper, and returned to the present – convinced I had discovered the greatest hobby of them all; one that enables anyone who would dare, to go where Orson Wells, Jack Finney, and others could only dream of going: back in time. I will never sell this newspaper… I will be 60 in November and lived in Brooklyn when Senator Kennedy was killed. I still shed tears when I think about it all these years later. He left nine children (and a tenth on the way) and a wonderful wife, and we will never know what a difference this magnificent man with a huge heart would have made in the White House. I grieve for him as if he was close friend. 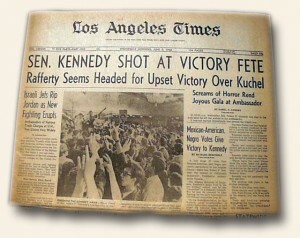 I will treasure this newspaper and others in my ample collection of the RFK assassination. Many collectors are quite familiar with Harry Rinker’s nationally syndicated radio talk show, “Watcha Got?”. Harry recently interviewed Tim regarding the Rare Newspapers collectible. Please enjoy the interview at (click on the audio mp3 button): Watcha Got? A recent piece on the web concerning the gift of a “stack of old newspapers” (see the hyperlink) to a grandson is a common story in our collecting world. A woman from Racine, Wisconsin, gave her grandson a box of historic newspapers, mostly World War II headline reports but including other events of the post-war era, collected by her husband. The photos show some nice banner headlines, several of the issues being the “Chicago Tribune” but including other titles from the Midwest. Such finds, or gifts, are typically the catalyst for a new-found hobby. And newspapers from the last 60 or 70 years can be found for even the most modest of collecting budgets. Our website features major events of World War II, the Holocaust, the space race, baseball, Korean War, Vietnam War, Watergate–you name the event and it’s likely among the 2600+ issues from this era found on our website. Many prices range from $20 to $40 while some more significant events or dramatic headlines achieve higher values, and would be among the best newspapers for any collection. Atmosphere versus Events – which newspaper-collecting path to tread? 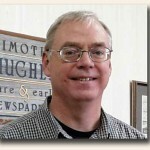 Newspaper-collecting is something of an oddity in the collectibles and antiques scene. That’s because it’s not the printing house – or the paper/ink – which makes a newspaper valuable to the collector. It is something more ephemeral. It’s the very words that are printed on those yellowing sheets (or not so yellowing for pre-1875 issues), and how they connect to the unfolding story of the times. In other words, it is content, not the vessel, that can elevate one newspaper above all others, in the eye of the collector. It’s also true to say that, because that collection of news-stories, articles, pictures and adverts are a snapshot of the very essence of an historical epoch – its life-and-times, its mores and outlook – that collectors can be looking at the same newspaper with very different eyes. Some want plenty of local interest, some are fixated on a great news story, some collect certain types of coverage religiously – and some are even looking for specific writers or illustrators. you’d do well to try and understand the different viewpoints of these two camps. It’s not just a philosophical point – chasing ‘atmosphere’ versus ‘event’ can help decide whether a paper is worth one dollar, or a hundred. the landing on the Moon, or the sinking of the Lusitania. The reason these big events are so important is that, for many people, who would otherwise not come close to buying a historic newspaper, they resonate a strong chord with them. Having such a bold historical headline, framed and on the wall, is a way of displaying this strong emotional connection. And because so many people are seeking out these original ‘event’ newspapers, the pent-up demand drives up the value. be sad if your newspaper-collecting was restricted to only these mammoth events – which can be counted on fingers and toes for most countries. find the moral contrasts of Prohibition-era America, for example, with its gangsters and raids and flighty fashions, irresistible. For example, there was a particular buzz, recently, over ‘frontier rags’ – newspapers that rolled out across the frontier, as the West was opened up. Some of these papers had short printing runs, and even shorter lives, as towns boomed and bust. That makes them pretty rare and exotic, and so a lively market grew up around these. Of course its impossible to predict trends in atmospheric collecting such as these. Far better is to follow your instincts, and build a collection around what interests you. That way a labor of love will provide its own rewards, and any financial boon will come as a pleasant surprise. And that motto makes sense whichever path – event or atmosphere – your choice to take. Rare Newspapers… What to collect? Feel free to share your thoughts on ideas for collecting rare and early newspapers: themes, eras, topics, etc. In the past the History’s Newsstand Blog has featured posts on the upper end of the collectible: “Prices Realized” and “Most Collectible Issues“. We are now taking a look at the other end of the spectrum – (low cost) entry points into the hobby. A few weeks ago we explored low cost issues from the 20th century. This post moves back in time to the 19th century. The following selection provides a glimpse of the wide variety of 19th century issues available valued at $15* and under. Areas of interest include the War of 1812, religious-themed, youth-themed, snap-shots of 19th century city life, and more. Many more exist on the Rare Newspapers’ website, but others can be found throughout the collectible community as well. The item numbers for each are linked to corresponding images. * All prices shown were valid as of the release date of this post. In the past the History’s Newsstand Blog has featured posts on the upper end of the collectible: “Prices Realized” and “Most Collectible Issues“. To kick off the new year we thought it might be nice to look at the other end of the spectrum: “Entry Points to the Rare Newspapers Collectible”. Throughout this month we will target examples of the least expensive collectible newspapers available for each century. The following selection provides a glimpse of the wide variety of issues available valued at $15* and under. Areas of interest include shipping, finance, theater, historic events, and more. Many more exist on the Rare Newspapers website, but others can be found throughout the collectible community as well. The item numbers for each are linked to corresponding images. 575571 BEACON, Philadelphia Navy Yard, 1944 A military paper produced at the Navy Yard with a great wealth of war-related content and a war-related masthead as well. I have been collecting newspapers longer than most fellow enthusiasts, beginning when I was at school in England in 1943. My father went into a small second-hand shop and noticed that the owner, who sold candlesticks, old dinner plates and suchlike, was wrapping up the items in copies of the London evening “Star” for 1818, that he was tearing out of a bound volume. There were about 150 papers left and my father, who was well aware of my budding historical interest, bought the whole volume for threepence (10c). From there I continued myself, often picking up items from shopkeepers who had no idea what they were. Nearly 70 years later, with several thousand items in store, (particularly London national papers, but also items from many other countries) some of my prize items, going back to the earlier sixteenth century, are still those that I found in the English back streets during my time as a schoolboy and later as a university student! A four page promotional piece announcing the completion of a 30 year project titled: “History and Bibliography of American Newspapers 1690 – 1820”, now commonly referred to simply as “Brigham”, its creator, includes some statistical information which might be of interest. Brigham notes that from 1690 to 1820, there were 2120 different newspapers published. Of this totals the six New England states had 447; the six middle Atlantic states from New York to Maryland had 1023; the ten Southern states from Virginia to Louisiana had 425; and the seven Western states had 225. The city which from the beginning to 1820 had the most newspaper was New York with 138, followed by Philadelphia with 107, and Boston with 73.